Tired of your mundane weekly trips to the grocery store? Switch things up--and support local businesses--by checking out one of Philly’s many farmers’ markets! Not only will you find the freshest produce and locally made foods, but it’s also a relaxing way to spend an afternoon. Some vendors even offer samples of their custom culinary creations, so we suggest you bring your appetite (and a reusable bag to haul everything home)! Here’s a list of some our favorite farmers’ markets in the city and ‘burbs but feel free to tweet us yours @Phillyfunguide. There’s so much going on in this West Philly community hub, including one of the largest farmers’ markets in the city. Expect a variety of vendors manning tables loaded up with organic fruits, heirloom vegetables, local honey, fresh pastries, cheeses, meats and more. Rittenhouse Square is one of the most picturesque small parks in Philadelphia, right in the middle of Center City. Visit this Farm to City-produced market for fruit,vegetables, beef and eggs from pasteurized animals and more. This market’s vendors have a strong focus on seasonal offerings, and also features the best of Media’s local shops and restaurants. This South Philly market in Dickinson Square Park showcases local artists and crafters alongside seasonal produce, fresh baked goods, dairy products and sustainably raised meats. Chestnut Hill has everything you love and expect from a farmers market, and it’s also a frequent location for Foolish Waffles, one of the best food trucks in the city! 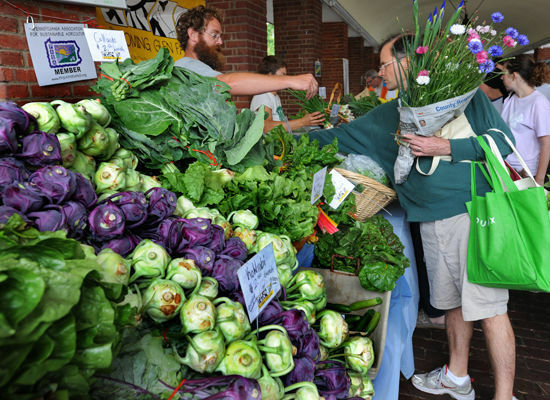 What makes the Bryn Mawr Farmers Market stand out on this list? We have to go with Local wine from Blue Mountain Vineyards. Greensgrow isn’t just a giant farmstand, it’s also a community hub. All food are grown or sourced locally, and they offer a robust CSA program. The Fairmount Farmers' Market is right across from historic Eastern State Penitentiary, and offers goats’ milk dairy products, fresh produce, fresh-baked pastries, artisanal breads and pop-up dessert shops. On 4th Thursdays, there’s also knife-sharpening service for all of you top chefs. HeadHouse Farmers Market offers a reprieve from the hustle and bustle of South Street, allowing you to indulge in fresh fruits and vegetables from more than 40 vendors, plus specialty wine and coffee sellers.